The Best Western Gatwick Skylane Hotel is the ideal location for your business conference. The Hotel is easily accessible by road and rail, and the proximity to Gatwick airport also provides an added advantage. 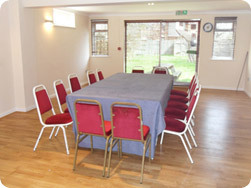 There are two conference rooms available: the Bonehurst Suite and the Heritage suite. Both rooms are capable of providing ample space for you conference, and we have a full range of extra equipment available to hire. Hire charges start from £90 for the Bonehurst Suite and £180 for the Heritage Suite.